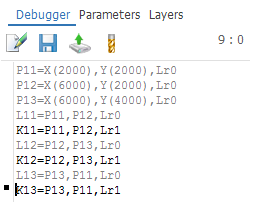 Choose the <Debugger> tab to open the debug panel. The debug panel provides access to the conversational representation of all 2D object definitions, in the current plane. Simultaneous viewing of the graphic and conversational elements is possible and interactive editing of separate parameters. Object definitions in the current plane are displayed as a sequential list of instructions on the screen using the geometrical processor language. Modification of the defining text of an element will lead to automatic regeneration of all objects constructed using the modified element. All object definition methods have a corresponding conversational structure. This means that, an interactive creation of a 2D object will create a corresponding definition in the debug panel. Some definition methods may require auxiliary constructions. These auxiliary constructions are performed automatically; indices of the objects that are created are between 1 and 10. Auxiliary objects are not displayed in the graphic view. The button switchs the <Edit mode> on.